After a successful export of bands like Arcade Fire and Half Moon Run, Canada yet again distributes their latest musical pride to the world in the form of Rah Rah. 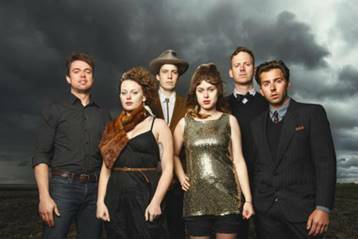 Rah Rah quickly became the masters of slacker-power-pop by being voted Canada’s Best Alternative Band, as well as having their previous album put forward for the 2013 Polaris Prize. Now the band are finally ready to release their much anticipated new ‘Vessels’ LP with the hope it will outshine its predecessor. Chip Off The Heart is the lead single from the record. With its firmly held indie-dance backbone it sounds like the unusual lovechild of Mando Diao’s Dance With Somebody and Le Tigre’s Eau D’Bedroom Dancing. Fix Me on the other hand, brings in a tone of hooky melodies resembling HAIM, The Bangles and The Pierces, whilst adding to the already rich pallet of Rah-Rah’s sonic knacks. What’s very special about Rah-Rah is the fact their sound simply cannot be pigeonholed. Each one of the 11 tracks on the LP can be associated with a long list of very eclectic artists yet always upholding Rah-Rah’s individuality. Good Winter is a real indie hit with a main focus on the breakaway drums and electric guitar solos. While as Fix Me focused on a more dance pop anthem with resemblances to The Pierces and Lucius. The penultimate track called Surgery also calls in for immediate attention. Why? Because the image it portrays very vividly when listening to it is Interpol doing a fast-paced indie duet with ABBA inside the famous Studio 54. Rah-Rah have clearly mastered the power of sonic freedom which they assimilated with every bit of every song on the record. In other words, Rah-Rah are destined to turn many heads and ears with their upcoming ‘Vessels’ LP and is available for sale and download now. Rah-Rah are also currently on a tour of Europe!